So, I started this fateful day out by making the drive out to Kahana around 10am or so, only to find it completely washed out with squalls. 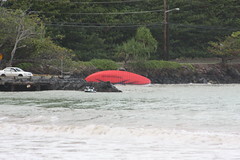 So, I grabbed Marc and Ray and we headed to Lanikai where the winds seemed to be a little better. Once we got to the LZ we realized it too was a bit too strong and flyin' didn't seem to be on the agenda, so we settled for pupus at Reapers. After about an hour of football highlights and a bunch of BS'n, I checked the winds only to find to my suprise that the wind gods had answered our prayers...We were goin' flyin' !!! Here we go again, second trip out to KNA... I spoke with Alex and he too assured me its lookin' good and would soon be joinin' the caravan at launch. I arrived shortly after 3pm and did a wind check at the LZ...guess what? Super light! but doable. So I started the dismal hike and made it to low, then mid and finally upper launch, where I was soon joined by Alex and the rest of the gang: Reaper and Kui, Marc, Ray, Don and Rich. This is where things get interesting. The winds had slacked off so much the streamers were pointing at the ground... Every now and then a light cycle would come through and then out of nowhere, the wind was at our backs! I think we were all in utter amazement but it was conceivable due to a large squall that pushed back into the valley behind KNA. So there we were perched up at high launch eagerly awaiting that window of opportunity... Both Alex and myself were determined - we were geared up and ready to go at a the first sign of wind. After about 20-30 minutes of hangin' around, the streamers started pointing up at us. Here it is guys...let's do this! Alex took first dibs and took off and I was seconds behind him, into what seemed to be a perfect cycle at the time.... Little did we know what lay in store for the both of us. I watched Alex cruise across to the North ridge... Here I come dude! After a picture perfect launch I was airborne! It felt perfect until my first turn, then this is where everything went badly.... NO MORE WIND! It's gone - it can't be! I immediately started sinkin' out, so I turned back towards the hill...nothin' but sink, then a left turn and my wing was all over the place. ROTOR! from where??? I knew I was in trouble and I hear Reaper "Its more north then you thought" so instinctively I think I'm in rotor from rhino/N launch so I veer right and across the valley thinkin' if I punch thru it since I'm already in it and get out front of N launch I should be good...NOT! Sinking air everywhere - there was nowhere I could go without the trees getting closer to me. I couldn't even make it to the low North launch to top land so I make a right turn to run to the LZ as fast as possible. In the meantime, I'm getting tossed around like a ragdoll and I have no idea what Alex is dealin' with and Reap is yellin' "head to the beach, the beach, the beach!" and I'm thinkin' "I know, I know, I know!!!" After I make my right, and still in sink I realize situationally: I'm well below low launch, God, I can't even hillside land I'm so stinkin' low.... Well, I have two choices at this point... Tree landing or run for it. So yep - I ran for it. Now I know I'm not makin' the beach - it was clearly obvious, so I decide to go for the boat ramp, which seemed like the most likely decision. "I got it, I'm on glide" NOT! Another heart stopper... more freakin' rotor and plenty sink, but I held my course. I knew at this point I'm committed... So, all I could think was get over the water in case I take a collapse and stay close to the shoreline while holding my line to the ramp...."Oh yeah, I think I got it"....NOT! More massive sink so I'm hands up for max glide and speed and droppin' fast. I know my fate at this point, it's gonna be a wet one! So, I take aim for the set of trees just alongside the ramp and pretty much hit my mark. My thoughts were if I could get just a little bit more glide I could land the wing on the branches overhanging the water and just maybe get my lower half wet. Wrong again. So, I came in fast, and there it was...splash down! I managed to get a couple bouncing skids across the water before the wing overflew me and pulled me over onto my face. And to my surprise, the water was only like 8 inches deep! And when I pushed myself up the wing was fully inflated in a perfect wall resting on top of the water, leading edge down only about 3 feet from the trees. WOW! what a rush. I tried to call Reap but unfortunately my radio and iPhone were fried. Moments later, Hillbilly and Scrappy managed to drag me and my wing to shore and we all had a few laughs at my expense. Scrappy managed to get it all on camera which you will all be able to enjoy at some point. I managed to walk away from this unfortunate situation with mostly my pride damaged and some electronics that need replacement. But, I can't help but think how lucky I really am because it could have had a much worse ending for me and Alex, who I later learned had experienced the same nasty, rotory conditions. I'm sure he will post his own personal experience, that I was unable to witness. There was some valuable lesson learning today for the new guys as well as for the experienced pilots.... Don't be the wind dummy! LOL, no really, don't be in a hurry! Had we waited a few minutes to see what the real deal was, we probably would have made a better judgment call and not found ourselves in this predicament. welcome to the swimming club. i think Alex should design a couple of tshirts for "honorary" members of Kahana/Makapuu Flying Swimmers. but seriously, glad you're ok, sorry for your electronics, but sounds like you got away pretty easy. It seems like so many of have been bapitzed into the church of free flight over the years that the old adage, "It's not 'if' you land in a tree, it's 'when' you land in a tree," should bechanged to, "It's not 'if' you go in the drink, it's 'when' you go in the drink." I've been there on two separate occasions . . . once, losing all of my electronics: phone, vario, and radio; expensive. I call it a "Training Loss." It's how the paragliding gods force us to stay humble, vigilant, and BROKE! Bummer! But being back on the ground all in one piece is the most important. I had a scary moment on Tomato Juice at launch yesterday. Pretty darn east and my wing came about three inches from brushing the wire as I launched and turned left away from the hill. 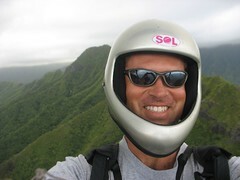 Alwasy exciting to launch/land here on Oahu. I was suffering from the journalists dilemma. Stand my ground and get the money shot of the action and watch Joey swim, or take off running to get to the water probably 2 late to help anyway and miss the shot. I think I chose wisely.